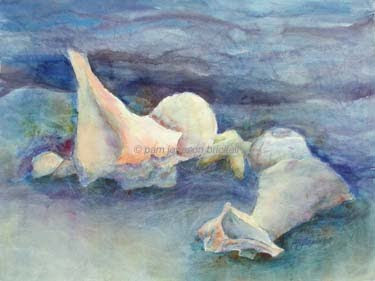 I'm getting excited about this weekend's Bluffton Arts & Seafood Fest Fine Art Show. In celebration of this event my bird and wildflower paintings will be hanging out (no pun intended) with sea animals :) Nothing like branching out! While my Blue Crab piece frames up to 12 x 10 inches, the Shells come in at a whopping 25 x 30 inches. This piece ought to grab some attention - at least I hope so!! Wow this is beautiful Pam! There's no way your work won't be noticed. Good luck at the show this weekend!